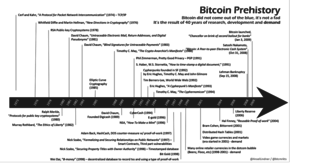 "Bitcoin is not a list of cryptographic features, it’s a very complex system of interacting mathematics and protocols in pursuit of what was a very unpopular goal. While the security technology is very far from trivial, the why was by far the biggest stumbling block – nearly everybody who heard the general idea thought it was a very bad idea. 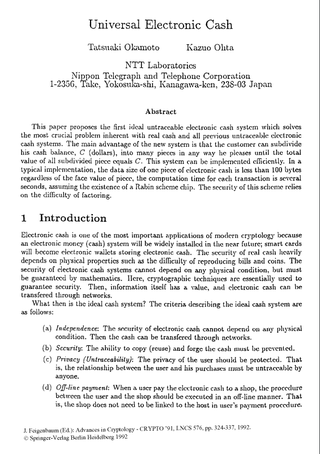 Myself, Wei Dai, and Hal Finney were the only people I know of who liked the idea (or in Dai’s case his related idea) enough to pursue it to any significant extent until Nakamoto (assuming Nakamoto is not really Finney or Dai). Only Finney (RPOW) and Nakamoto were motivated enough to actually implement such a scheme." I believe I’ve worked through all those little details over the last year and a half while coding it, and there were a lot of them. The functional details are not covered in the paper, but the sourcecode is coming soon. I sent you the main files. Sometimes we consider here the nature of consciousness, whether observer moments need to be linked to one another, the role of causality in consciousness, etc. I thought of an interesting puzzle about Boltzmann Brains which offers a new twist to these questions. As most readers are aware, Boltzmann Brains relate to an idea of Boltzmann on how to explain the arrow of time. The laws of physics seem to be time symmetric, yet the universe is grossly asymmetric in time. Boltzmann proposed that if you had a universe in a maximum entropy state, say a uniform gas, then given enough time, the gas would undergo fluctuations to regions of lower entropy. Sometimes, purely at random, clumps of molecules would happen to form. Even more rarely, these clumps might be large and ordered. Given infinite time, one could even have an entire visible-universe worth of matter clump together in an ordered fashion, from which state it would then decay into higher entropy conditions. Life could evolve during this decay, observe the universe around it, and find itself in conditions much like our own. The Boltzmann Brain is a counter-argument, suggesting that the universe and everything else is redundant; all you need is a brain to form via a spontaneous random fluctuation, and to hold together long enough to engage in a few moments of conscious thought. Such a Boltzmann Brain is far more likely to form than an entire universe, hence the vast majority of conscious thoughts in such a model will be in Boltzmann Brains and not in brains in large universes. If we were tempted to explain the arrow of time in this way, we must accept that the universe is an illusion and that we are actually Boltzmann Brains, a conclusion which most people don't like. Now this scenario can be criticized in many ways, but I want to emphasize a couple of points which aren't always appreciated. The first is that the Boltzmann scenario, whether a whole universe or just a Brain is forming, is basically time symmetric. That means that if you saw a movie of a Boltzmann universe forming and then decaying back to random entropy, you would not be able to tell which way the movie was running, if it were to be reversed. (This is an unavoidable consequence of the time symmetry of the underlying physics.) It follows that while the universe is moving into the low-entropy state, it must be evolving backwards. That is, an observer from outside would see time appearing to run backwards. Eggs would un-scramble themselves, objects would fall upwards from the ground, ripples would converge on spots in lakes from which rocks would then leap from the water, and so on. At some point this time reversal effect would stop, and the universe would then proceed to evolve back into a high entropy state, now with time going "forwards". Now, the forward phase will not in general be an exact mirror image of the reverse, because of slight random fluctuations and the like, but it will be an alternate path that essentially starts with the same initial conditions. So we will see one path backwards into the minimum-entropy state, and another path forwards from that state. Both paths are fully plausible histories and neither is distinguishable from the other as far as which was reversed and which was forward, if you ran a recording of the whole process backwards. One might ask, what causes time to run backwards during the first half of the Boltzmann scenario? The answer is, nothing but very, very odd luck. Time is no more likely to continue to run backwards, or to run backwards the same everywhere in the local fluctuation-area, than it is to start running backwards right now in the universe around you. Nothing stops eggs from unscrambling themselves except the unlikelihood, and the same principle is at work during the Boltzmann time-reversal phase. It is merely that we select, out of the infinity of time, those rare occasions where time does in fact "happen to happen" like this, that allows us to discuss it. I want to emphasize that this picture of how Boltzmann fluctuations would work is a consquence of the laws of thermodynamics, and time symmetry. Sometimes people imagine that the fluctuation into the Boltzmann low-entropy state is fundamentally different from the fluctuation out of it. They accept that the fluctuation out will be similar to our own existence, with complex events happening. But they imagine that the fluctuation into low entropy might be much simpler, molecules simply aggregating together into some convenient state from which the complex fluctuation out and back to chaos can begin. While this is not impossible and hence will happen occasionally among the infinity of fluctuations in the Boltzmann universe, it will be rare. It will be no more common for a "simple" fluctation-in process to occur than for a simple fluctuation-out process. In our universe, knowing it will evolve to a chaotic heat death, we might imagine that molecules would just fly apart into chaos, but we know that is highly unlikely. Instead, by far the most likely path is a complex one, full of turbulence and reactions and similar activity. By time symmetry, exactly the same arguments apply during the fluctation-in phase. The vast majority of Boltzmann fluctuations that achieve a particular degree of low entropy will do so via complex, turbulent paths which if viewed in reverse will appear to be perfectly plausible sequences of events for a universe which is decaying from order to disorder, like our own. Following on to this, let us consider the nature of consciousness during these Boltzmann excursions. Again let us focus on larger scale ones than just Boltzmann Brains, although the same principles apply there. During the time reversal phase, if conscious entities are present, their brains are running backwards. They are talking backwards, walking backwards, doing everything in reverse. They remember things that are coming in the future, and forget everything as soon as it has happened. The question is, is there any difference in consciousness during the reverse and forward phases? Consider that during the forward phase, we started with a low entropy state, and now the laws of physics are playing out just as they do in our own universe. Everything is happening for a reason, depending on what has happened before. Events cause memories to appear in brains by virtue of the same causal effects which give rise to our own memories. Hence I imagine that most would agree that brains during the forward phase are conscious. However, during the reverse phase, things are quite different. Brains have memories of things that haven't happened yet. Again, one might ask how this can be. The reason is because we stop paying attention to fluctuations where this doesn't happen. We only focus on Boltzmann fluctuations which take the universe into a plausible and consistent low-entropy state, one from which things can evolve in a way that is similar to what we see. When a brain remembers something, if that doesn't happen, the fluctuation is inconsistent. We skip over that one and look for one that is consistent. In the consistent fluctuations, brain memories turn out to be correct, purely by luck. Similarly, every internal function of the brain which we might attribute to macroscopic-type causality, like neuron A firing because neuron B fired, will happen instead by luck, with neuron A firing as though neuron B is going to fire, and then neuron B just happening to fire in precisely the anticipated way. The point is that during the time-reversal phase, causality as we normally think of it is absent. Subjectively-past events do not cause subjectively-future ones; rather, subjectively-future events take place before subjectively-past events, and it is merely through luck that things happen in a consistent pattern. Again, if we hadn't gotten lucky so that things work out, we wouldn't have called this a Boltzmann fluctuation of the kind we are interested in (Boltzmann Brain or Boltzmann Universe). By paying selective attention to only those fluctuations where things work, we will only observe cases where luck, rather than causality, makes things happen. But things do happen, in the same pattern they would if causality were active. So the question is, are brains conscious during this time? Do the thoughts that occur during the time reversal (which recall is not exactly the same as what happens during the forward-time phase) have the same level of subjective reality as thoughts which occur when time runs forward? We can argue it either way. In favor of consciousness, the main argument is that time is fundamentally symmetric (we assume). Hence there is no fundamental or inherent difference between the forward and reverse phases. The only differences are relative, with the arrow of time pointing in opposite directions in the two phases. But within each phase, we see events which can both be equally well described as leading to consciousness, and therefore conscious experiences will occur in both phases. On the other side, many people see a role for causality in the creation or manifestation of consciousness. And arguably, causality is different in the two phases. In the forward phase (the part where we are returning from a low-entropy excursion to the high-entropy static state), events follow one another for the usual reasons, and it is correct to attribute a role for causality just as we do in our own experience. But in the reverse phase, it is purely by luck that things happen in a consistent way, and only because we have an infinity of time to work with that we are able to find sequences of events that look consistent even they arose by simple happenstance. There is no true causality in this phase, just a random sequence of events where we have selected a sequence that mimics causality. And to the extent that consciousness depends on causality, we should not say that brains during this reverse phase are conscious. I lean towards the first interpretation, for the following reason. If consciousness really was able to somehow distinguish the forward from reverse phases in a Boltzmann fluctuation, it would be quite remarkable. Given that the fundamental laws of physics are time symmetric, nothing should be able to do that, to deduce a true "implicit" arrow of time that goes beyond the superficial arrow of time caused by entropy differences. The whole point of time symmetry, the very definition, is that there should be no such implicit arrow of time. This suggestion would seem to give consciousness a power that it should not have, allow it to do something that is impossible. And if the first interpretation is correct, it seems to call into question the very nature of causality, and its posible role in consciousness. If we are forced to attribute consciousness to sequences of events which occur purely by luck, then causality can't play a significant role. This is the rather surprising conclusion which I reached from these musings on Boltzmann Brains. 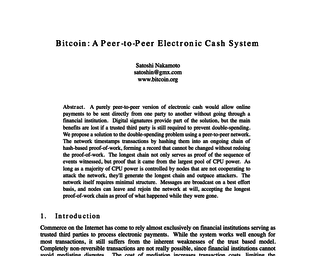 This link leads to the now-famous white paper published on bitcoin.org entitled "Bitcoin: A Peer-to-Peer Electronic Cash System." 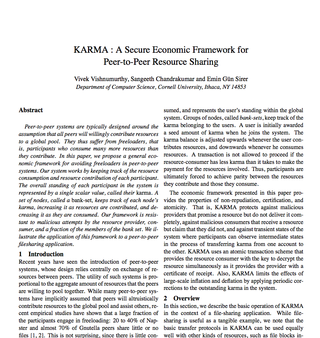 This paper detailed methods of using a peer-to-peer network to generate what was described as "a system for electronic transactions without relying on trust". 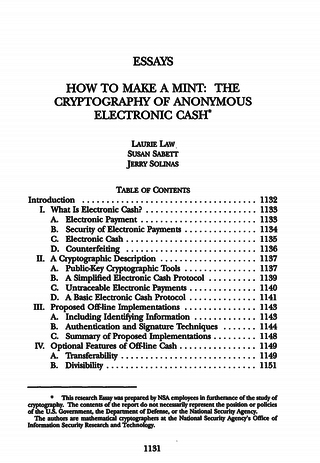 This paper would become the Magna Carta for how Bitcoin operates today. On 18 August 2008, the domain name bitcoin.org is registered. Today, at least, this domain is "WhoisGuard Protected," meaning the identity of the person who registered it is not public information. Craig has personally conducted in excess of 1,200 IT security related engagements for more than 120 Australian and international organizations in the private and government sectors and now works for BDO Kendall's in Australia. These engagements have comprised of security systems design (including the design of critical network infrastructure), IT audit, systems implementation, staff training and mentoring, cross functional team development, policy and procedural development, business process analysis and digital forensics. 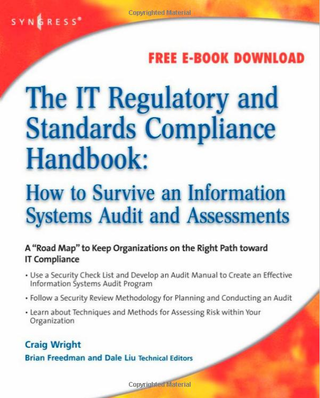 In addition to his consulting engagements, Craig has authored numerous IT security related articles and is a co-author of "The Official CHFI Study Guide (Exam 312-49)". 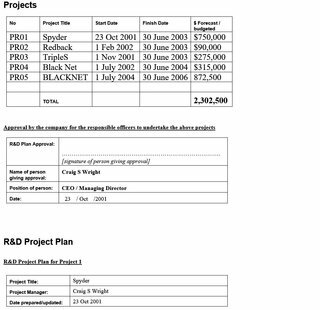 Craig has been involved with designing the architecture for the world's first online casino (Lasseter's Online) in the Northern Territory, designed and managed the implementation of many of the systems that protect the Australian Stock Exchange and also developed and implemented the security policies and procedural practices within Mahindra and Mahindra, India's largest vehicle manufacturer. 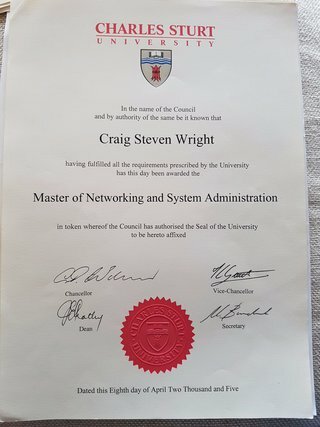 Craig holds (amongst others) the following industry certifications, CISSP (ISSAP & ISSMP), CISA, CISM, CCE, MCSE, GIAC GNSA, G7799, GWAS, GCFA, GLEG, GSEC, GREM, GPCI and GSPA and has completed numerous degrees in a variety of fields. 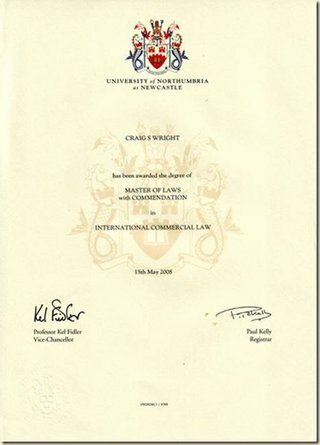 He is currently completing both a Masters degree in Statistics (at Newcastle) and a Masters Degree in Law (LLM) specialising in International Commercial Law (E-commerce Law). Craig is planning to start his second doctorate, a PhD in Economics and Law in the digital age in early 2008. Unlike most people, I have realised the value of time from when I was a youth. My latest adition of goals is to listen to the 90,000 most influential pieces of music throughout history (as judged by myself). This is a 20 year plan. Hildegard of Bingen was born in 1084 and at 14 entered a Benedictine nunnery outside of Worms (the Rhineland). She became the Abbess in 1136 and subseqently moved her order to Rupertsberg - outside of Bingen. She composed 77 vocal works (including 43 Antiphons) collectively known as the Symphonia armonie celestium revelationum. This is a truely mystic collection of vocal works. A great reflective collection. On top of this I alsolistened to Symphony No. 8 from Dimitri Shostakovich. This was the 1988 preformance conducted by Yevgeny Mravinsky. This is reflective, bitterly powerful and emotionally transcandent. This is a dark and brooding work reflecting a true depth of emotion and experiances I can not begin to comprehend. Yet in it lies hope. Non-repudiation is the process of ensuring that a parties to a transaction cannot deny (this is repudiate) that a transaction occurred. Repudiation is an assertion refuting a claim or the refusal to acknowledge an action or deed. Anticipatory repudiation (or anticipatory breach) describes a declaration by the promising party (as associated with a contract) that they intend to fail to meet their contractual obligations. Afternoon, All. 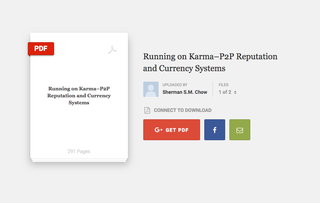 Today marks the eighth anniversary of the publication of the Bitcoin white paper. As a special tribute, I will provide you with a short story on the origins of the Bitcoin tech. I've been out of the game for many years, however now I find myself drawn back - in part due to the energy that's being added by the incumbents, in part due to information that's become public over the past year. I haven't followed the Bitcoin and alt coin tech for the past five or six years. I left about six months before (2). My last communication with (2) was five years ago which ended in my obliteration of all development emails and long-term exile. Every mention of Bitcoin made me turn the page, change the channel, click away - due to a painful knot of fear in my belly at the very mention of the tech. As my old memories come back I'm jotting them down so that a roughly decent book on the original Bitcoin development may be created. The following are a few of these notes. This is still in early draft form so expect the layout and flow to be cleaned up over time. 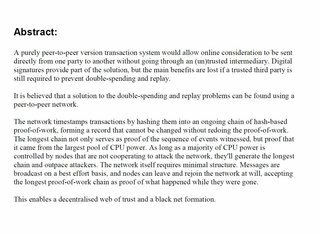 Also be aware that the initial release of the Bitcoin white paper and code was what we had cut down to from earlier ideas. Tominaga Nakamoto (富永 仲基 Tominaga Nakamoto, 1715–1746) was a Japanese philosopher. He was educated at the Kaitokudō academy founded by members of the mercantile class of Osaka, but was ostracised shortly after the age of 15. Tominaga belonged to a Japanese rationalist school of thought and advocated a Japanese variation of atheism, mukishinron (no gods or demons). He was also a merchant in Osaka. 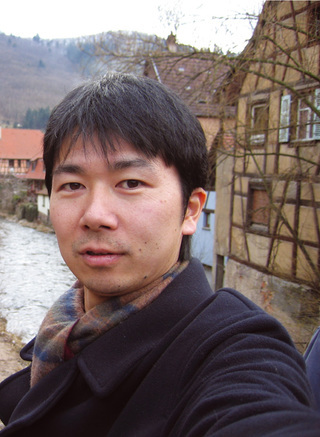 Only a few of his works survive; his Setsuhei ("Discussions on Error") has been lost and may have been the reason for his separation from the Kaitokudō, and around nine other works' titles are known. The surviving works are his Okina no Fumi ("The Writings of an Old Man"), Shutsujō Kōgo ("Words after Enlightenment"; on textual criticism of Buddhist sutras), and three other works on ancient musical scales, ancient measurements, and poetry. 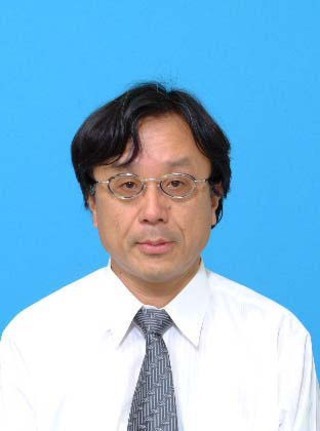 He took a deep critical stance against normative systems of thought, partially based on the Kaitokudō's emphasis on objectivity, but was clearly heterodox in eschewing the dominant philosophies of the institution. He was critical of Buddhism, Confucianism and Shintoism. Whereas each of these traditions drew on history as a source of authority, Tominaga saw appeals to history as a pseudo-justification for innovations that try to outdo other sects vying for power. For example, he cited the various Confucian Masters who saw human nature as partially good, neither good nor bad, all good, and inherently bad; analysing later interpreters who tried to incorporate and reconcile all Masters. He criticised Shintoism as obscurantist, especially in its habit of secret instruction. As he always said, "hiding is the beginning of lying and stealing". In his study of Buddhist scriptures, he asserted that Hinayana school of scriptures preceded Mahayana scriptures but also asserted that the vast majority of Hinayana scriptures are also composed much later than the life of Gautama Buddha, the position which was later supported by modern scriptural studies. "Even though (2) and (3) weren't as high in the crypto world and as knowledgable as the folks I wanted to interact with, they had factors which placed them far above any of these others. You are always there for me Dave. I want you to be part of it all. I cannot release it as me. GMX, Vistomail and Tor. I need your help and I need a version of me to make this work that is better than me. RE: Defamation and the diffculties of law on the Internet. When this becomes public record, I will post-up the results. not know what you are missing. probably had as much fun reading up on the subject as did. degrees Fahrenheit, gas mark 4). Remember to take your grill pan out first. cookies, in the comfort of your own home. Yep Craig is a Junkie; a Knowledge Junkie!!!! For those of you who have nothing good to say; why say anything? Subject: RE: Defamation and the diffculties of law on the Internet. (March 7 &amp; 8, 2008" in Newsbytes Vol 10.20.
as that of employers and other parties remains a risk. by most organisations and not unfortunately by many of the list. monitor and filter (or at the least act on) content. have collected a number of statistics over the years. 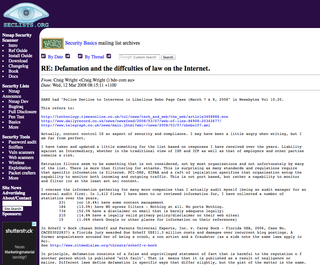 In Scheff v Bock (Susan Scheff and Parents Universal Experts, Inc.
See <a href="http://w2.eff.org/bloggers/lg/faq-defamation.php" rel="nofollow">http://w2.eff.org/bloggers/lg/faq-defamation.php</a> for details. companies (based on figures above) will not detect or stop anything. Texas at Austin - School of Law. coming years. The maximum expected payout would be $50,000,000 US. Scheff v Bock, this is only going to increase. capacity of their employment under the doctrine respondeat superior. (c) a person who has authority to act on behalf of a principal. leave the principle directly liable rather then liable vicariously. illegal does not exclude it from the scope of employment[vii]. employer or agent from the effects of vicarious liability[viii]. placed as a representative of his master"[xiii]. the principles agent, the principle is deemed to be directly liable. circumstances, vicarious liability would extend to the employer. manner to achieve what was in effect authorised. held to be liable for the employee's actions. for the criminal behaviour of their employees. employee's perpetration of the crime. those actions of employees concerning the abuse of new technologies. facsimile photographs of a child under 16 that are indecent. committing offences using the Internet. [i] Broom v Morgan  1 QB 597. [ii] Employees Liability Act 1991 (NSW). [iii] G E Dal Pont, Law of Agency (Butterworths, 2001) [1.2]. [vii] Bugge v Brown (1919) 26 CLR 110, at 117 per Isaacs J.
Pty Ltd and Others -- BC9603040 -- 4 July 1996. 716 [xii] (1949) 79 CLR 370 at 381 [xiii] Ibid. [xiv]  1 TLR 101 (CA). 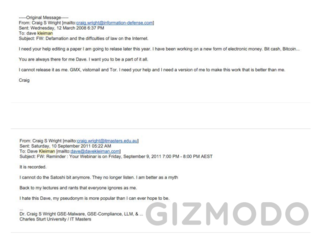 Company  2 KB 836, at 845 per Atkin J.
Craig Wright certainly qualifies as a security hero! He has written articles and books on security and has nearly every SANS and GIAC certificate available (including platinum). He is a GIAC Technical Director, and jack-of-all-trades, master of a few, and all of us at the security laboratory thank him for his time! 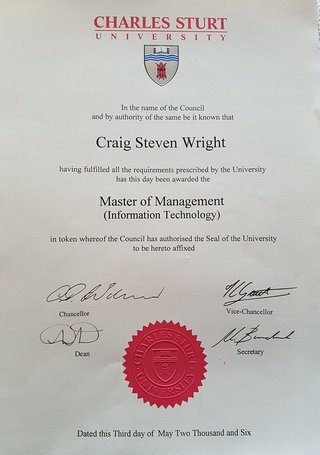 Craig, I see that you are qualified in a number of disciplines including having just completed a master’s degree in law. So why did you choose information security? When I was young, information security didn’t really exist as a career. I started doing some simple programming tasks and moved into a role as a SunOS 4.1 administrator. We had a custom developed database on the system and, at that point, security was generally the least of anyone's concerns. I had been tasked with ensuring that the data on the system remained secure and that the system was available, but there was no budget for security. Back in the days before the Web, Gopher proved a great tool for finding information. What I started learning about back then was just how many vulnerabilities exist. I got into a little bit of trouble from time to time when I would demonstrate some of the vulnerabilities. This led to a reputation as the guy who could "break into stuff" - something that was both good and bad. When systems needed to be configured I would be consulted, but I also found that I was would be blamed when anything went wrong. So, of course, when firewalls came about in the mid-90s, I was the one that they where handed to. I stayed in security as it is something that I do well and it allows me to give back to the community. So, how did you learn about firewalls back then? 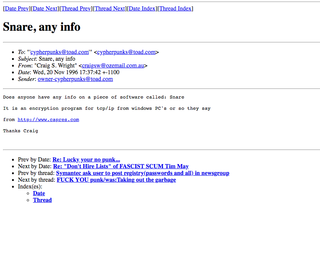 Back then it was even more of the "wild wild web" than now. I cringe at some of the things we did. I started by putting together bits and pieces that I'd dug up and basically cobbled together a halfway decent firewall using the firewall Toolkit. Back then code was available, and a lot simpler, so much of the learning process was really playing. This followed when I started working for an ISP. I was basically given a copy of Checkpoint firewall-1 version 2 and expected to know it by the end of the week. This wasn't as bad as it seemed since having worked with the firewall Toolkit and Gauntlet, I found Checkpoint to be easy. What about "security cowboys" in the 90s? 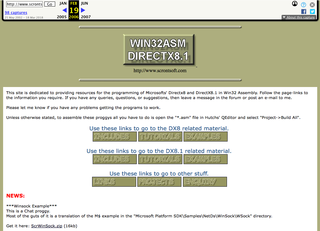 Back then it seemed that the security methodology was to download some security tool that compiled on a Sun 3, how were those times for you? In the 90s most of us were, basically, cowboys. Back then, methodologies didn't exist; and if you wanted some level of functionality, you had to make it yourself. Mistakes were a common occurrence, but what really mattered was if you learned from those mistakes. 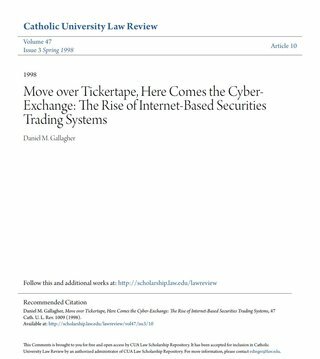 The biggest change for me was taking a role in the Australian Stock Exchange where I managed the firewalls and other security devices. Working in an environment with a six 9's requirement for uptime was a real eye-opener. 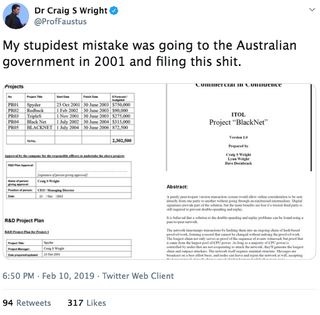 More than anything else, the ASX taught me the benefits of a well planned project. I also learnt VMS. The ASX beat the cowboy out of me. How do you build your skills? Practice, practice, practice. And, add to that a lot of reading. Also, since I have to commute, I have used text to audio conversion software and changed papers to MP3 files, so I listen to these as I drive. This takes care of the theory, leaving time to practice the various tools and techniques at home. Add to that a huge amount of training from SANS and others, and an inability to get out of Uni, and that about covers it. These days, it has become even simpler. I act as an editor for a technical publisher and also author my own papers and books. Getting paid to conduct technical reviews is a great way to stay on top of things. I noticed that you have an eclectic collection of qualifications. Has this helped your security career, or is it just out of general interest? I have found that knowledge in a wide range of topics makes it easier to understand the viewpoint other people are coming from. Having studied finance and law has made my role as an auditor easier. I’m sure that many of my clients do not see it this way since I have a habit of pointing out obscure points of law they may not be complying with, but my role as an auditor is to point out risk to management. I stay sane as I’ve learnt that it is not my problem on how they act to what I’ve pointed out to them. As long as I can ensure that they have an accurate understanding of risk they face, I’ve done my job. Statistics and data mining skills have helped this. I get told all the time that there are not enough sources of data to be able to create adequate quantitative risk models. This is where I find that a mathematical foundation would help many in the industry. Methods such as longitudinal data analysis provide the means to scientifically model an organisation's risk. The difficulty is that these methodologies do not lend themselves to simple tools and require an analysis focused on the particular organisation. Do you see security as an art form or science? In practice it should be progressing towards more of a science than an art. However, very few people treat it this way. Unfortunately, marketing and hype obscures much of what is really important. Many of the simple practices that make a site secure don’t lead to an opportunity to sell services. As such, many of these are ignored. 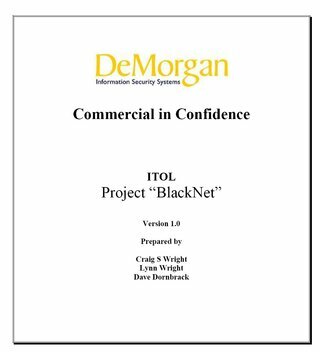 On top of this, many people have the idea that the only way to test a system is by using a black box format in an attempt to simulate (falsely) what a “hacker” would do. I mean, I am happy to take on organisation's money and spend a day or two doing basic preliminary investigations that any script kiddie can do if they require it of me, but I'm much happier just getting the information from them and saving both of us time and them money. I see far too much hype around the skills related to attacking and breaking into a system and, by far, not enough effort into securing systems. After all, it takes far more skill to properly secure a system than it does to break into one. So what do you see as the major problem with auditing and compliance? I have to say the major problem is that people attempt to tick a box rather than fix a problem. Often, more effort is put into avoiding fixing a vulnerability or other issue than would be taken to correct it. Another problem is that the industry is really geared away from fixing the problems. We seem to do our best to avoid confronting clients with the risk that they actually face. Many people say that compliance regimes such as SOX do little to secure a system. The truth is that this is not related at all to the compliance regime but to the general avoidance of them. As a case in point, we have been engaged to re-perform tests for SOX clients that are unrelated to the security of the system. On instructing the client that the controls they have implemented will not make them compliant with the requirements of SOX, we have been instructed to simply rerun the test of the controls in place. So, it is not to say that SOX does not lead to a secure system, but rather people do their best to avoid it. In other cases, I have seen companies create their own stored procedures on a database to obscure data fields so that they can pass a PCI audit. The auditor is never given enough time to test all the systems, so hiding what is actually occurring is an easy way to become “compliant”. The silly thing is that, in many instances, the amount of effort to hide non-compliance is far greater than what would be required to make the system compliant. So why do organizations try to avoid securing systems in your view? It certainly seems like there are two basic keys to information assurance, configuring systems correctly and detecting when the configuration fails. Yet, proper configuration does not seem to get much emphasis. There seems to be a lack of knowledge and understanding about security that has not disappeared over the years and, if anything, has gotten worse. As security professionals, we have to take a lot of the blame. Many of us spend our time bickering over obscure issues and things that don’t really matter. We really need to step back and take a risk-based approach. Some training in economics and finance would be a great benefit to many people in the industry. I certainly hear you about the bickering over obscure issues; I love Schneier's point in Beyond Fear, we tend to love Security Theater. What benefit do you see that studying economics and finance would offer the average Security professional? We might be able to start having a risk-based approach. At the moment, too many of the issues in security come down to personal preferences. We really need to stand back and look at the true cost. 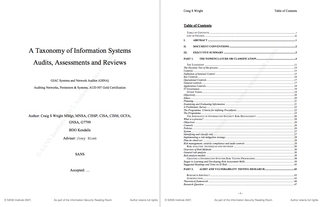 Rather than installing that nice new toy with its six-figure price tag, maybe a little bit of time looking through and testing a few configuration standards (such as those from SANS and CISecurity.org) would benefit. So, where do you see yourself in the future? Ideally, I want to move into a technical research role. In my ideal position I would be either CTO and security evangelist or lab director. At the moment, I conduct research in my own time. The ideal would be having someone pay me for doing what is essentially my hobby. Both electronic and paper documents are subject to tampering. 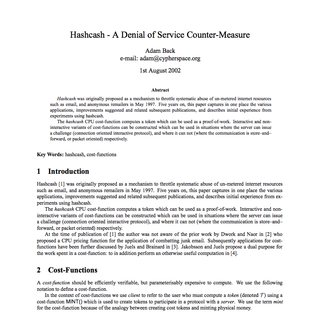 The discovery of collisions has demonstrated that the process of signing a hash signature is not without its own vulnerabilities. In fact, the collision allows two versions of the document to be created with the same hash and thus same electronic signature. Our attacker wants to have the second document as the one that is signed. By doing this they have increased the sale contract by $500,000. Confoo is a tool that has been used to demonstrate two web pages that look different, but have the same MD5 hash (and there are also issues with other hash algorithms as well). 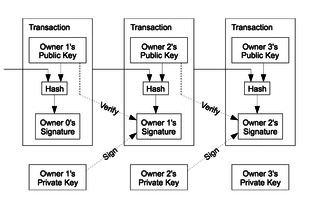 Digital signatures typically work using public key crypto. 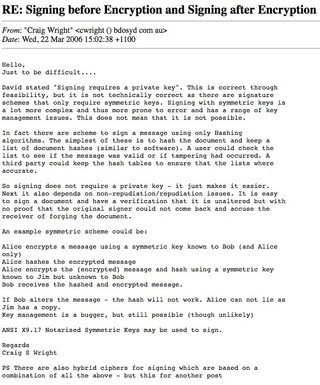 The document is signed using the private key of the signer. The public key is used for verification of the signature. The issue is that public key crypto is slow. So rather then signing the entire document, a hash of the document is signed. As long as the hash is trusted, the document is trusted. The concern is that collisions exist. So back to the issue. Our attacker takes order 1 and order 2 and uses the Confoo techniques (also have a look at Stripwire). The client is sent a document that reads as “order 1” and they agree to buy a product for $500,000. As such they sign the order using an MD5 hash that is encrypted with the buyers private key. Our attacker (using Confoo style techniques) has set up a document with a collision. Order 1 and Order 2 both have the same hash. Our attacker can substitute the orders and the signed document (that is a verified hash) will still verify as being signed. The ability of Microsoft Word to run macros and code makes it a relatively simple attack to create a collision in this manner. So, electronic documents do need to be re-read – but it is simpler in that there are tools to verify these. Ensure that the Hash used is trusted and even use multiple hashes together. 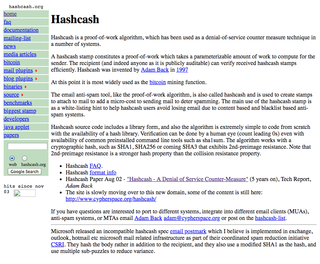 This attack works due to the nature of hashing algorithms. If you have 2 documents, x and y that have the same hash (i.e. a collision) then by appending an additional block of information – q to the documents will also result in a collision. This is (x+q) will have the same hash as (y+q). When contrasting contractual principles, it is clear that where a contract is not required to be in writing (Columbia Law Review, Apr., 1929 Pp. 497-504; Columbia Law Review, Jun., 1907, pp. 446-449; McKendrick, E, 2005, p 184), that little additional uncertainty could be created where the contract is completed electronically. In fact, it is clear that electronic evidence must hold greater weight than verbal evidence (Lord Justice Auld, Sept 2001, Cpt 11). What is not clear is the extent of the weight attached to the various forms of electronic evidence. 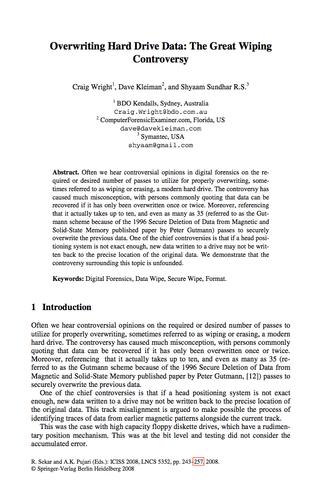 The strength of a digital signature algorithm and the security surrounding the mechanisms used to sign an electronic document will respectively influence the weight associated with any piece of electronic evidence. 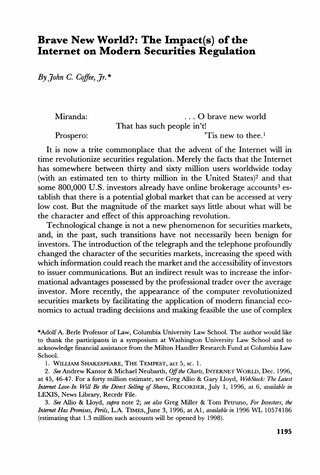 It has been argued that the digital contract may appear on the computer screen to consist of words in a written form but merely consist of a virtual representation (Allison et al, 2003). The ECA has removed the uncertainty and doubt surrounding the question as to the nature of electronic form used in the construction of a contract. In this, the ECA specifies that the electronic form of a contract is to be accepted as equivalent to a contract in writing. An electronic contract has a twofold structure. Thought of electronically, the contract is a sequence of numbers and code saved to some electronic or magnetic medium. Alternatively, the contract becomes perceptible through a transformation of the numeric code when broadcast to a computer output device such as a printer or screen(Bainbridge, 2000; Reed, 2004; Brownsword, 2000). Prior to the passing of the ECA, this dichotomy exasperated the uncertainty contiguous with whether an electronic contract can be regarded as being a contract in writing. The English legal doctrines of offer, acceptance and consideration when coupled with an intention to create legally binding relations define the necessary conditions for the creation of a contract. There is no necessity for the most part [Excluding contracts such as for the transfer of real property, which are covered by a variety of specific acts] that any contract be concluded in writing. The question as to whether contracts performed electronically are legalistically equivalent to writing comes more to a question of evidential weight and the application of the parole evidence rule (Durtschi, 2002; Lim, 2002). 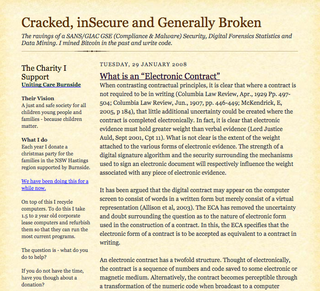 By stating that electronic contracts are equivalent to writing, the ECA has in effect, forbid the introduction of extrinsic evidence which could change the terms of the electronic contract. The question would remain as to a determination of whether the electronic communications contain the final agreement between the parties. Where some, though not all, of the terms are agreed in the electronic communication, a partial integration will result in the allowing of extrinsic evidence (Treitel, 2003). A just and safe society for all children young people and families - because children matter. Each year I donate a christmas party for the families in the NSW Hastings region supported by Burnside. We have been doing this for a while now. On top of this I recycle computers. To do this I take 1.5 to 2 year old corporate lease computers and refurbish them so that they can run the most current programs. The question is - what do you do to help? If you do not have the time, have you though about a donation? 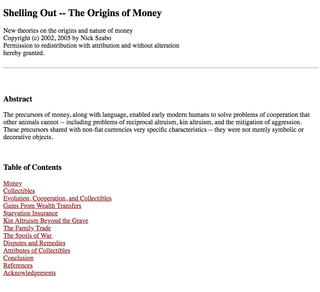 This blog has been monetarised. This is where the money goes. By clicking and purchasing on this site, you help Burnside and Hackers for Charity. All monies earned here are split 50/50 between these two charities. Strange that you should pick on architecture. We have the fall of a piece of major \ architecture today which as killed a large number of people. The 2nd by the same \ person. The twin towers failed due to structural deficiencies more than the planes. \ Do you wish for me to quote the statistics on architectural failure? They are greater \ than you may think. You seem to make the simplification that all code can be written correctly and \ tested. That no matter how long and complex there is a way of determining the error \ rate - this is wrong and I shall get to this in the post. I will even help you \ develop an argument that you may use to dispute me. The majority of libraries used in development (excluding open source eg Linux) are \ complied object code. Are you expecting that the world stop using all code unless \ they have the source? That all source be checked? Dijkstra developed the method "correct by construction". He also did extensive work \ on the mathematical proof of algorithms. Please read the works below. Kert Godel, Alan Turning and Alonzo Church (GTC) did work which resulted in \ "Computability Theory". They discovered that certain basic problems cannot be solved \ by computers. Cohen, Hollingworth and Dijkstra all developed this theory further. Now I stated I would get to error determination. GTC demonstrated in computational \ theory that it is not possible to create a machine that can determine wether a \ mathematical statement is true or false. All code and programming is a mathematical \ statement or algorithm. The determination of the codes function is a mathematical \ proof (see Cohen and Dijkstra). As it is not possible for either an automata or turning machine to determine the \ correctness of the programme, it is not possible to determine the effects of code. Dijkstra's started work on formal verification (what you are calling for) in the \ 1970's. Formal verification was the prevailing opinion at the time. This was that one \ should first write a program and then provide a mathematical proof of correctness. "The Cruelty of Really Teaching Computer Science" (Dijkstra, 1988) saw Dijkstra \ trying to push computable correctness. This missed the need for engineers to \ compromise on the one hand with the physical world and on the other with cost \ control. This is the issue. To move ahead and develop code that people want we can not \ complete mathematical software verifications. No machine (at least yet known) can \ verify code. 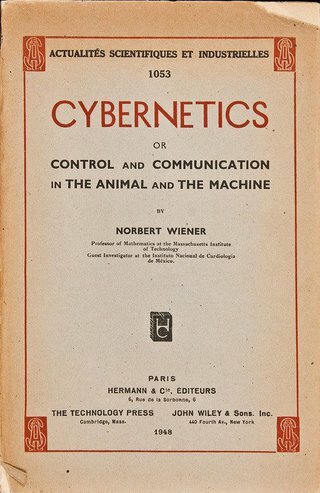 The term machine refers to the computer science idea of a machine - not \ a physical item. To state that all code should be verified would be great for myself. I am a \ mathematician. Computers can not verify code (see the theory of computation). This \ would make my mathematical skills in greater demand and help next time I go for a \ raise. I seem to be adding facts to the discussion. Dijkstra, Turing et al are the people \ who created the foundations of computer science. Please feel free to add comment on the use of finite state machines, labelled \ transition systems, Petri nets, timed automata, hybrid automata, process algebra, \ formal semantics of programming languages such as operational semantics, denotation \ semantics, Hoare's logic or any other existing method of computational verification. I have attached a paper of Dijkstra's. This paper could act as a foundation for your \ argument. Dijkstra argues for formal verification against software engineering. \ Please feel free to build on the argument - if you manage to come up with something \ that is verifiably valid not only will you get to have one up on me you may be \ remembered in years to come in the computer science discipline. 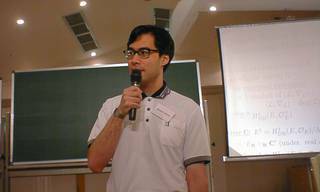 In 2005 Bernard NotHaus attended a hackers convention in Amsterdam. At that conference he met a younger man who called himself "Satoshi Nakamoto". The man later spoke to Joseph Vaughn Perling. In that conversation the man described what was to later become bitcoin. Bernard disclosed this in an interview in Feb 2014. "Gnarled roots of a creation theory"
Doctor of Theology in Comparitive Religous and Classical Studies - Guess (I am an ex-chatholic who is now involved in the UC) Ask me and I may share. I act as a lay pastor and I do not always desire to argue with people who have no concept of religion. I was a catholic, became an atheist, and moved towards the uniting church as I learnt more in science and mathematics.If you need to ever need to know of Dionysus, Vesta, Menrva, Ceres (Roman Goddess of the Corn, Earth, Harvest) or other Mythological characters - I am your man. I could even hold a conversation on Eileithyia, the Greek Goddess of Childbirth and her roman rebirth as Lucina.I bet you did not know that Asklepios Aesculapius is the Greek God of Health and Medicine or that Lucifer is the name of the Roman Light-bearer, the God and Star that brings in the day. Extra-activity: A comparitive study of Greko-Roman foundations to the Judeo-Christian origins of the Eve belief and myth structure.If you are really lucky (or unlucky as the case my be) I may let you read my dissertation:"Gnarled roots of a creation theory". packets and then watching for garbage. 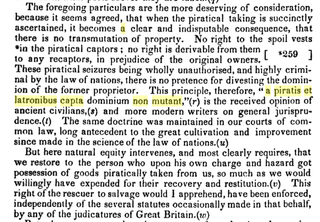 monetary exchange and contract enforcement for pseudonyms. 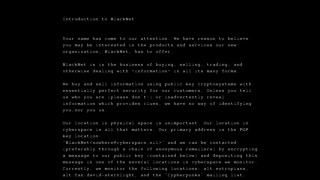 Please direct all follow-up discussion of these protocols to cypherpunks. Wed. March 12, 1997, at 2pm. Panelists: Roger Clarke, David Chaum, Michael Froomkin, and Tim May. Ver 1.2 Mar 12, 1997. © 1997 A. Michael Froomkin. All Rights Reserved. Permission granted to copy for non-profit uses. For the foreseeable future I predict these new payment media will have major economic effects only in the part of the economy that uses small and micro-transactions. Unless legal rules change significantly, consumers who live in jurisdictions that provide legal protections for debit or credit cards transactions will tend to use them for larger payments. After all, why use e- cash when you can use a credit card and cancel the payment if the seller fails to deliver what was promised? 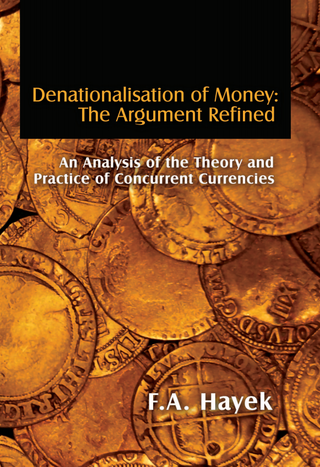 Thus, e-cash will have relatively modest overall effects on commerce, the money supply, and the economy. And e-cash will have equally modest effects on taxes and social mores. govenment, I do not feel I should have to pay as well. get off their butts and work. > > not to work hard and prepare themselves. > > Do you have health insurance? > > Do you have life insurance? > > seems to me that an important part of the discussion is missed. > > unable to work for several years. > Understand what it is you are saying. Send a message with the subject "send pgp-key" for a copy of my key. The killer application for electronic networks isn't video-on-demand. It's going to hit you where it really matters - in your wallet. It's not only going to revolutionize the Net, it will change the global economy. Clouds gather over Amsterdam as I ride into the city center after a day at the headquarters of DigiCash, a company whose mission is to change the world through the introduction of anonymous digital money technology. I have been inundated with talk of smart cards and automated toll takers and tamper-proof observer chips and virtual coinage for anonymous network ftps. I have made photocopies using a digital wallet and would have bought a soda from a DigiCash vending machine, but it was out of order. My fellow passenger and tour guide is David Chaum, the bearded and ponytailed founder of DigiCash, and the inventor of cryptographic protocols that could catapult our currency system into the 21st century. They may, in the process, shatter the Orwellian predictions of a Big Brother dystopia, replacing them with a world in which the ease of electronic transactions is combined with the elegant anonymity of paying in cash. He points out the plaza where the Nazis rounded up the Jews for deportation to concentration camps. This is not idle conversation, but a topic rooted in the Chaum Weltanschauung - state repression extended to the maximum. David Chaum has devoted his life, or at least his life's work, to creating cryptographic technology that liberates individuals from the spooky shadows of those who gather digital profiles. 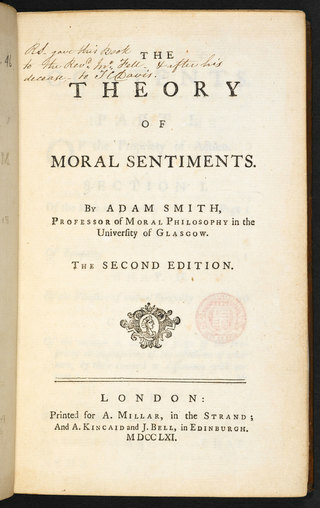 In the process, he has become the central figure in the evolution of electronic money, advocating a form of it that fits neatly into a privacy paradigm, whereby the details of people's lives are shielded from the prying eyes of the state, the corporation, and various unsavory elements.